The largest American craft brewery, Sam Adams, and the oldest brewery in Germany, Weihenstephan, have teamed up to produce a prize beer called Infinium. They are awfully secretive about the supposedly novel process used to make this beer. The end result is not that unlike champagne, or in fact, DeuS, another bright, bubbly golden ale. They may not have intended this to be a winter beer, but it will fit nicely into your holiday celebrations. Infinium pours a very hazy golden yellow with a copper tint. The off-white head is thick and solid. A spicy nose greets you immediately, featuring cinnamon, nutmeg, and allspice. A sweet bready maltiness follows, reminiscent of challah. This beer has the sort of mild yet complex aroma that makes you sit back and contemplate, content taking only a whiff. The flavor of Infinium is likewise sweet and spicy, with some cinnamon and plenty of cloves. There is a significant alcoholic bite (reasonable, given it’s over 10%) which is restrained but invigorating. There are some floral and grassy noble hops as well. The palate is light, lively, and effervescent, but still rich and serious. I shared several bottles with my family tonight, and here are some of their comments. I stopped in at the Radegast beer hall on 3rd Street in Brooklyn. Plenty of wood and dim lights decorate this bar that has at least a dozen choices on tap at any given time. They’ve got a fair bottle menu of mostly German lagers and Belgians to boot: the entire line of Lindeman’s impresses me, the Boon Gueuze impresses me more. Lively staff, mustard produced in-house, and (according to my buddy Trevor) tasty sausages. I had a draft of Vitus, a bock beer made with wheat (weizenbock), produced by the oldest brewery in the world, Weihenstephan. The brewery (as well as the university of the same name) sit atop a mountain overlooking the town of Freising in Bavaria. I’m not sure the Radegast should be offering this beer in 1.5 liter mugs; just one full liter of a beer over 7.5% alcohol is probably plenty. The Vitus pours a golden straw color and deeply hazy. The generous head is frothy and bone-white. A strong spiciness and shades of banana lead the aroma and are accompanied by cloves and an earthiness. Rich bready malt flavor and some residual sweetness almost entirely hide the alcohol. All that is present is the spice and just a hint of heat. A light herbal hop character complements this and balances the malt. The faintest hint of bananas. Creamy carbonation gives a soft and rounded body. This is the first of several posts that I took notes for in Germany but didn’t get around to finishing. The last few weeks there and the first few back home were hectic. Anyway, on to the beer. While traveling with my mother around the Middle Rhein Valley, I had a chance to try the beer from one of the smallest breweries in Germany, Bacchusbräu in Bacharach, Rheinland-Pfalz. 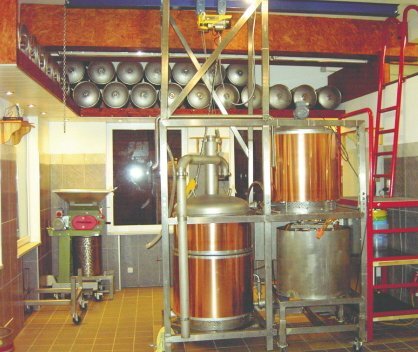 On their 200 liter brewing system Armin Mahl makes the beer to go along with wife Annette’s wonderful cooking. But this is truly just the Theatergastronomie adjacent to the theater they built, which features marionette shows as well as ones with regular actors. On one side of the building, directly facing the old city wall, and beyond it the Rhein, there is a patio under the canopy of an old carousel and a fence made of barrel staves. I was impressed with just about everything about this place. They bake a rich and savory mini loaf of multigrain bread called Braumeisterbrötchen – Brewmasters’ Rolls – that are stuffed with fillings. 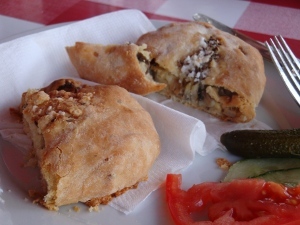 The vegetarian one had cheese, mushrooms, onions, and caraway seeds, and was divine. Oh, and their cat is ridiculously friendly. I started out with the standard lager, Loreley. They call it a pilsener but it really seems to me to be a classic Munich helles. Named after perhaps the most famous rock in the world, Loreley is easily one of the best German beers I have had the pleasure to taste. A yellow gold with a beautiful haze is topped with some creamy white head. The rich malty aroma is thick with bread and just a little sweet. Delicate floral noble hops dance. The flavor of Loreley is barely dry, but still has a strong malt richness. The high quality malt used clearly shows through, so the beer tastes quite fresh. The palate is full and round without intruding. It is not bitter, but rather remarkably balanced. Next I had the Münchner dunkel, called 1689. I’m not certain what the name refers to, though I know that year there was some unpleasantness related to the Nine Years’ War in nearby Mannheim and Heidelberg. A pleasingly opalescent very pale hazelnut brown with some white head. The aroma is light, with malty caramel and hints of hops, and a little sweetness. It is promising, but much too fleeting. The flavor is also a bit on the mild side. Caramel and toast malt flavors are complimented by an earthy and herbal hop character. The hops also lend a reasonable bitterness. Something is making it a bit astringent, which grows more prominent through the taste. 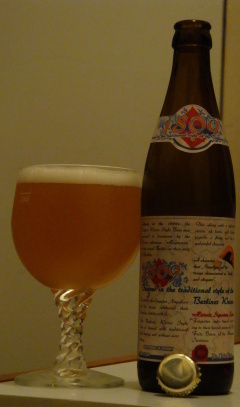 The palate is full but still drinkable, but the 1689 would benefit from a bit more carbonation. 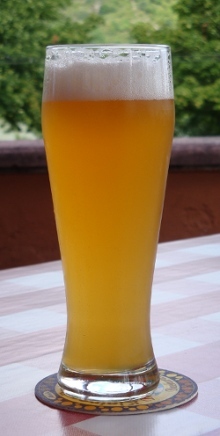 The wheat beer is named simply Bacchusweizen. It is naturally very hazy, and by looking at the bubbles rise, clearly very active. Golden straw in color with a creamy, cloudlike white head. The aroma is light and bready, with a lot of cloves as well. Some floral on the nose could be from hops. The taste of the Bacchusweizen is dry, with a solid clove flavor. There is a good wheat character manifesting as bread and rich maltiness. The light hop flavor is spicy, complimenting the clove from the yeast. The palate is dry and quite lively. The adding of flavor hops to weizen is a relatively new concept, but there are a few that do it do good effect, including this one. Even discounting the hops this beer is a unique hefeweizen, drier and spicier than most. Very refreshing. Finally the bock beer, Burg Stahleck – Verlies. Burg Stahleck is the castle overlooking the town of Bacharach, now a youth hostel. Verlies is the German word for “dungeon”. 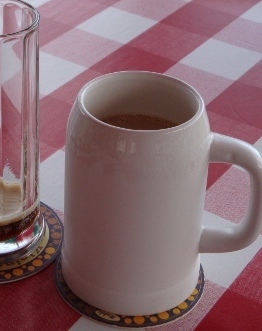 They properly serve this strong beer in a hefty stone mug. It is richly hazy, with a deep caramel brown color and creamy tawny head. The aroma is rich and sweet with caramel, dark fruit, and a rich spiciness of cinnamon and cardamom, pepper and cloves. The flavor is malty and sweet. The spiciness on the taste is quite strong, dominated by cinnamon and pepper. The alcohol makes itself apparent with a warming sensation. The whole of it almost gives the impression of brandy. The Verlies is full but not cloying, active but not bothersome, and rich but still drinkable. Just well-crafted strong beer goodness. Today is the last day my rail pass is valid, so to celebrate (mourn?) I am on the high-speed ICE traveling without any particular aim. Fortunately, I brought with me three altbiers, Niederrhein, Oscar Maxxum, and Hannen. 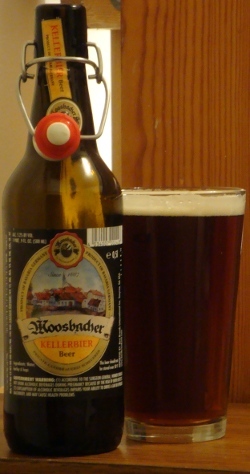 Altbier is the competitor of kölsch, traditionally brewed in Düsseldorf. Together with kölsch it is one of the only top-fermented beers in Germany (other than wheat beer). While a great kölsch is pale, clean, and fresh almost like water, the best alts have a deep amber color and a strong, flavorful malt presence. Altbier literally means “old beer”, recognizing the fact that prior to the invention of pilsner malt all beer was dark. 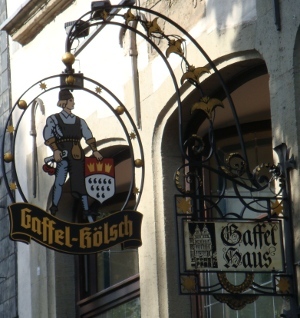 Düsseldorf was proud of their ale brewing tradition and refused to switch to the pale lagers that the rest of the world is inordinately obsessed with. Köln I guess took the middle path? 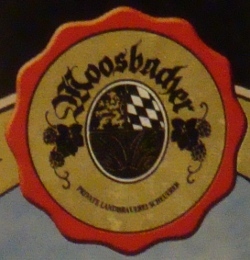 From the town of Korschenbroich, the brewery Kraushof-Vertriebs produces the Niederrhein Alt (literally “lower Rhein alt”). 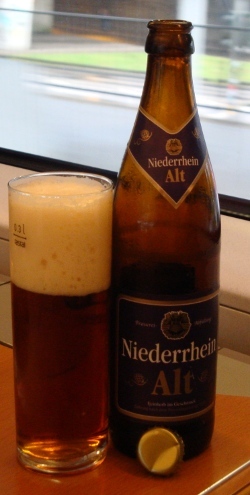 The Niederrhein is a golden copper color and lightly hazy. 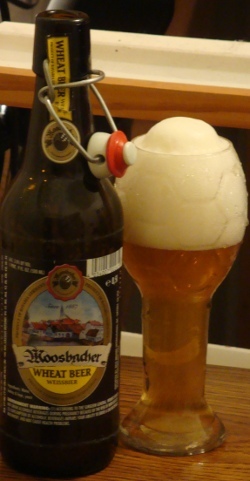 The thick and creamy beige head lasts and leaves a lacing on the glass. The nose is fruity with hops, an exotic yet familiar dark fruit. There is a caramel malt aroma that gets somewhat confused in the fruit. Unfortunately there is a bit of a papery character that disrupts the otherwise interesting aroma. The flavor is full of spicy hops that come through as cumin, pepper, and some oregano. The malt contributes toast and some sweetness. The palate is just a little bit thick, and the cardboard character is somewhat present in the taste as well. It may just be that this bottle is a little old, but it claims to be good until October, though that may mean it was brewed last October. Next up, the Hannen Alt (since 1725, supposedly), from Mönchengladbach, brewed and bottled for Carlsberg Deutschland. This alt pours a brilliantly clear ruddy copper. The meager off-white head does leave a decent lacing. The aroma is largely cardboard, though some caramel gets through and just the slightest bit of herbal hops. The greasy cardboard flavor leaves quite a bit to be desired. Some earthy hops come through, and a bit of caramel and toast from the malt. The palate is full and sweet, but still refreshing. This one says it will be good till next May, so there’s no excuse for age. The last alt I will try tonight is the Oscar Maxxum, brewed for Trinkgut, a beverage discounter based in Krefeld. This alt is a brilliantly clear copper color. There is some off-white head but it is gone quickly. The nose is lively. There is a definite hop presence that manifests itself as dark fruit as well as spices and herbs, making for an intriguing aroma. Some sweet malt character rounds it out. The flavor is, unfortunately, not quite as significant as the aroma. There is some caramel from the malt and an herbal hop flavor, but it seems a little bit flat. There is also a relatively strong bitterness that somewhat makes up for it. The palate is full, but the carbonation keeps it lively. Given that this is the house brand for a discounter, I am heartily impressed. A few folks from my program and I went on a brewery tour in Köln last weekend. To me ‘brewery tour’ implies a tour through a brewery, but instead it was a tour around Köln with stops at beer halls. It wasn’t what I expected, but it was a very good time anyway. 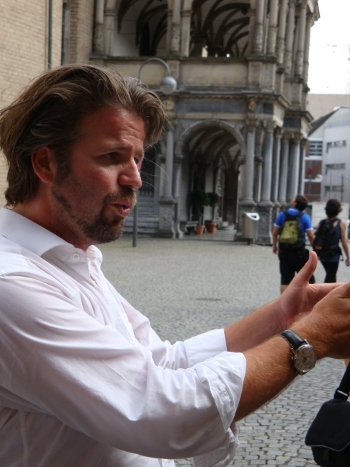 The guide was named Frank Möhlenkamp and he was quite entertaining. He had plenty of anecdotes about the history of Köln and a unique manner. He even gave a decent (if somewhat simplified) description of the brewing process. Not as much information about the beer as I would have hoped, but an entertaining evening nonetheless. The first place we stopped at was the Sion Brewery. On the outside of this beerhall is the supposed founding date 1318, but Herr Möhlenkamp was quick to point out that this simply means there was a brewery in that building in 1318, not a particularly surprising fact given the brewing tradition of Köln. He observed that one may elsewhere inside find a date of 1511, or if one were to dig a little deeper find the year 1912. I have noticed that this temporal confusion is a problem endemic with German breweries. The Sion Kölsch is a pale, brilliantly clear golden color with a thick white head that leaves a solid lacing on the glass. The nose is quite light, with just a bit of pale malt character and a fresh hop aroma. The body is full but remains refreshing. A bready malt flavor is light and intangible like gossamer. There are hints of grassy and earthy noble hops. The flavor is barely disturbed by a corn taste coming through. The second stop on our tour was a visit to the Köln bürgerhaus. When the Kölners rebuilt their city hall after the war, they built in statue enclaves that harken back to those for the saints on the outer walls of many gothic cathedrals. However, the statues here are important figures in the history of Köln. Perhaps the most interesting aspect is the figures underneath the statues, intended to represent what the person would see when they look in a mirror. The heroes of Köln would see angels and flowers and such, but the bottom row of statues holds the more infamous characters of Köln’s history, along with the Kölners’ impression of their true character. 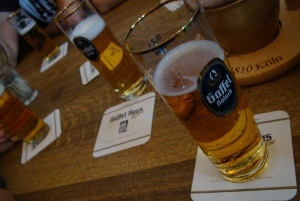 After the stop by the bürgerhaus we moved on to the Gaffel Brewery. 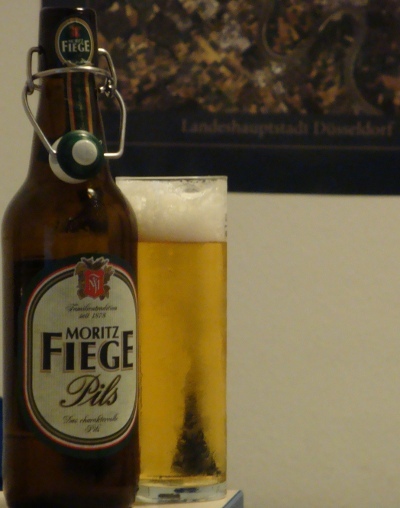 Gaffell (along with Reissdorf) is one of the kölsch beers that are widely available in the states. Nevertheless I had yet to rate it on this blog. The Gaffel Kölsch is a brilliant deep gold. There was some big-bubbled head but it went away quickly. It has some light and refreshing malt aroma. The flavor is somewhat malty, but mostly I just notice a sulfuric taste on the bottom of the tongue. It is also a little corny sweet and leaves a bit of a mouth coating. 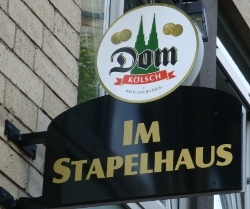 Our last stop was at the Dom Brewery, but as I had already rated that kölsch a little while ago I just relaxed and enjoyed the beer and company, something that is quite easy to do in Köln. Tonight I will taste three beers brewed in Köln (that’s Cologne to the uninitiated). 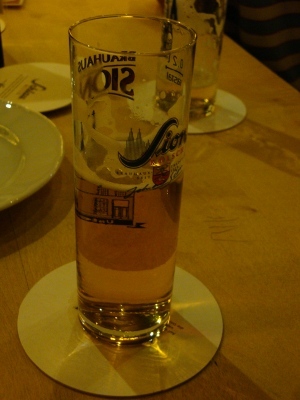 Beer from Köln is called kölsch, and it is a strong, pale lager with a particular fresh taste. Köln and Düsseldorf are two cities on the river Rhine with a long history of competition, particularly on the beer front. This is my first in a series of posts that will attempt to answer the age-old question: which beer is better, kölsch or alt? The first examples in the kölsch category come from three breweries I have otherwise never heard of. First up, an offering from Cölner Hofbräu Früh, the Früh Kölsch. After that I will try the beer made by Dom-Brauerei, Domkölsch. Finally I will have the one from Küppers Brauerei, Küppers Kölsch. The Früh Kölsch pours a brilliantly clear, lightly gold-tinted pale yellow. The head was bone white and a bit spongey, but now it’s all gone. The nose is malty sweet, with hints of white wine fruitiness and a trace of corn. The flavor is immediately rich with an herbal hop flavor. Some bitterness is present but is overtaken by a cloying sweetness. There is some malt flavor that comes through as bread, but mostly just the corny sweetness. The flavor lingers far too long, and the carbonation is not nearly active enough. The Domkölsch is also a brilliantly clear yellow, perhaps a little darker than the Früh. The head is likewise bone-white, but has a more structure and lasts a bit longer. The nose is cleaner, with only a light malt aroma and a bit of fruit. The flavor is also cleaner: it is almost tasteless. Some pure pilsner malt comes out, and a hint of sweetness. Just a bit of herbal hops peek through. The body is certainly thick and full, but unlike the Früh, not at all cloying. The Küppers Kölsch pours a brilliant yellow, paler still than the Früh. The head is white, but like the Früh, disappears very quickly. The aroma is almost nonexistent. A little corn is all I can get. The flavor is a bit hollow. It would be perfectly fresh if not for the persistent corn flavor. A bit of malty sweetness tries to compensate but doesn’t quite make it. The palate is full and lively, making for a very drinkable beer. The tiny Bavarian village of Moosbach is located on the Czech border, just a stone’s throw from Pilsen. 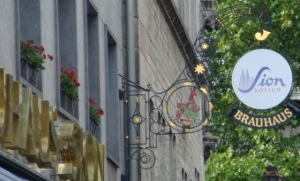 In the center of town, Brauerei Scheuerer was founded in 1887 by twenty-eight year-old Lorenz Scheuerer. Today the family brewery is run by fourth-generation Erhard, though they are proud that third-gen Johann II shows up every day, at least to drink “his 4 daily bottles!!!!”. They package their beer in swingtops, which I like for three reasons. First, you can drink half and leave the rest for later without losing too much carbonation. Second, as a homebrewer I’m always looking for ways to avoid capping bottles, so reusing swingtops is ideal. Third, I have a neat trick I can do with a swingtop bottle. Ask me sometime, I’ll show you. 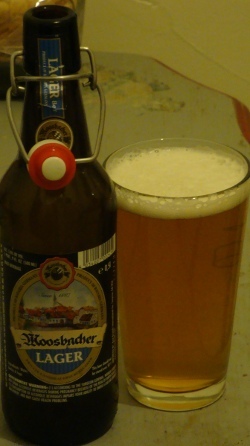 Brauerei Scheuerer produces the Moosbacher beers, a pretty standard Bavarian lineup. Besides what I’ll be tasting they offer two export lagers (Export and Zoigl), a pilsner, and a shankbier for children and ladies, their Leichte Weisse. I have two lagers and two wheat beers to try tonight. I’ll start with the helles, called just Lager, move on to the Kellerbier, and then the Weissbier. Finally, I will be interested to see if the Schwarze Weisse is in fact black or just a normal dunkelweizen. The Lager is a lightly hazy pale yellow. 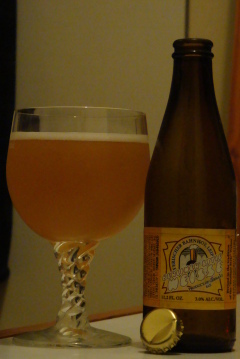 The head is bone white and creamy, leaves a lacing on the glass, but falls quickly. The aroma has good base malt character with just a bit of breadiness. Some noble hops and a level of Bavarian sulfur. A little sweet on the nose but still playful. The rich malt flavor practically sets you down in a Moravian barley field. Faint malty sweetness and strong hop bitterness (for the style). 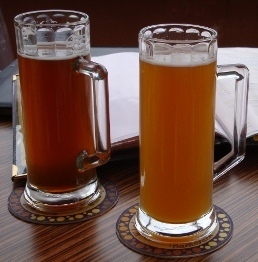 A healthy herbal hop flavor indicates the influence of the Czech way of brewing. Some contribution from sulfur compounds. Hints of many things, but none for very long: apricots, chocolate, peanuts, fresh cut grass. Full bodied but thoroughly refreshing. In my opinion this is among the top Bavarian lagers. The German Beer Institute calls helles lager a style of “infinite subtlety” and the Scheuerer family has certainly hit the mark there. The Kellerbier pours a barely hazy caramel color. The off-white head is creamy, but again, could last longer. The aroma is practically non-existent, so drink this one relatively warm. Hints of caramel and toast and just a bit of sulfur. The flavor is also much lighter than the Lager. A smooth and creamy malt flavor is accompanied by the finest noble hop character, but it is all much too timid. As it warms it picks up more caramel and toffee and gets a little sweet. Again the body is essentially perfect: a full mouthfeel but refreshing and quaffable. I was not expecting the kellerbier to take the subtlety so much further than the helles lager, but here we are. As if to pay penance for the first two, the Weissbier is effervescent to a fault. I had to pour out a whole glass of foam at first! The carbonation supports a strong and thick pure white head atop this pale golden yellow beer. The nose is full of banana. Also, wheat character, banana, some nuttiness, banana, clove, and banana. Very appealing, but actually not as rich as it might seem (for all the banana). And the taste is a total surprise. Clove city! I wish I knew what exactly creates a disconnect in flavor and aroma like this, because beers with this variety in their sensory experiences are such a treat. Strong piquant clove flavor with black pepper and oregano are accented by just a hint of alcohol spiciness. There is, of course, a banana character, and some wheat as well. The body is full yet smooth but borders on cloying, despite the extreme activity. 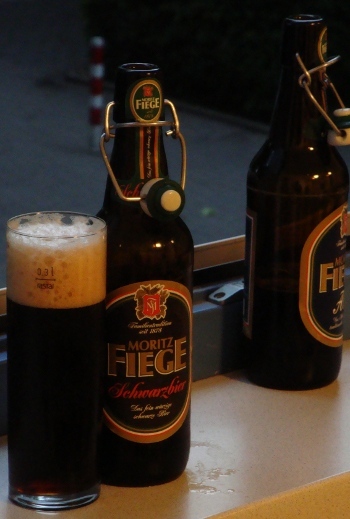 Last but not least, the Schwarze Weisse, which turns out to be a disappointing pedestrian amber color. Don’t get me wrong, it’s a beautiful beer, it was just framed for me in a particular way that didn’t come to pass. Oh well. 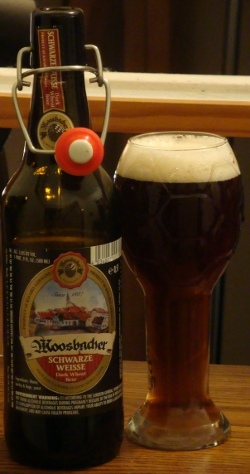 Fairly hazy, the Schwarze Weisse is a copper-colored amber with a decent amount of thick tan head. Nowhere near as excitable as its cousin the Weissbier. Subtle yet assertive, the nose is perfectly balanced. Cloves, bananas, and caramel malt come out in equal proportion. Really a textbook dunkleweisse aroma. The flavor is much less impressive: too clean. The cloves are there, but get outshined by black pepper. The banana is almost gone. A reasonable toasty flavor and some sweetness are the bulk of the taste. A bit of bitterness and hop flavor disrupt the impression of a wheat beer without being serious enough to count, so the beer ends up tasting flat. The palate is full but there is a lingering sweetness that gets to be unpleasant. After the stellar aroma I am pretty disappointed by the taste.